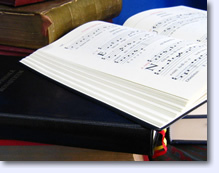 There are two major postconciliar Office resources that are important for Gregorian chant. Liber Hymnarius. This 1983 “hymn book” (G-2949) has all the Office hymns, which are now identical for the Roman and the Benedictine office. The melodies are restored to their original form, as are the texts, as called for by the Second Vatican Council. (If one is singing a well-known hymn such as Conditor alme siderum or Veni, Creator Spiritus in Latin or English, it would be best to use the melodic version of the Liber Hymnarius.) Especially important is the revised four-line notation of this book and the explanation of it (in Latin) in the foreword. The revised notation conveys much of the subtlety of the early neumes, and it makes clear that chant should be sung with the flexibility of speech-based rhythm rather than with equal rhythmic values. This revised notation will no doubt be employed when the reformed Roman antiphonale and the revised Graduale Romanum finally appear. Antiphonale Monasticum. Beginning in 2005, one volume per year of this four-volume edition has appeared. It provides a wealth of resources for various ways of celebrating the monastic Office in Latin. One controversial decision was not to include rhythmic signs (such as the horizontal episema) based on early manuscripts; many singers will regret their absence. It would be most helpful to have these interpretive indications, especially since they were part of the revised notation of the Liber Hymnarius. Many of the options in the reformed monastic Office are similar to the reformed Roman Office, and by using this edition along with the 1912 antiphonale, one could find almost everything for chanting the reformed Roman Office in Latin. Since this edition includes antiphons for the Sunday Benedictus and Magnificat tied to the three-year Mass lectionary gospel readings, one could freely use these antiphons with psalm verses at Sunday Mass and have Gregorian chant perfectly connected thematically with the liturgy. It is rather rare today to sing the Office in Latin (or, for that matter, in English). But it is important to know about the recent Office chant books, because they represent recent chant scholarship and developments, and also because the flexibility of the reformed liturgy allows for borrowing back and forth between Office and Mass music. Some might also want to know about the Office chants for the inclusion of some Latin when the Liturgy of the Hours is sung predominantly in English. The customary name for an Office books is an antiphonale (“antiphoner” in English), named because it includes so many psalm antiphons. An antiphonale contains everything for the Liturgy of the Hours—basic service music for the dialogs and responses, a hymn for each hour, antiphons for singing before and after each psalm, gospel canticles with their antiphons, and Marian antiphons customarily sung after compline.